We share this planet with 8.7 million other fascinating species; and today we are facing a new wave of extinction unlike anything since the demise of the dinosaurs. In the last 500 years, 844 species are known to have died out, and up to 16,000 others are now known to be threatened. to help save some of these incredible creatures? As well as seeing them in their natural habitat you can directly contribute to the protection of these endangered animals. In Brazil’s Pantanal the jaguar enjoys a protected status. They are notoriously elusive and tend to live in tropical forests, usually remaining under cover during the day. 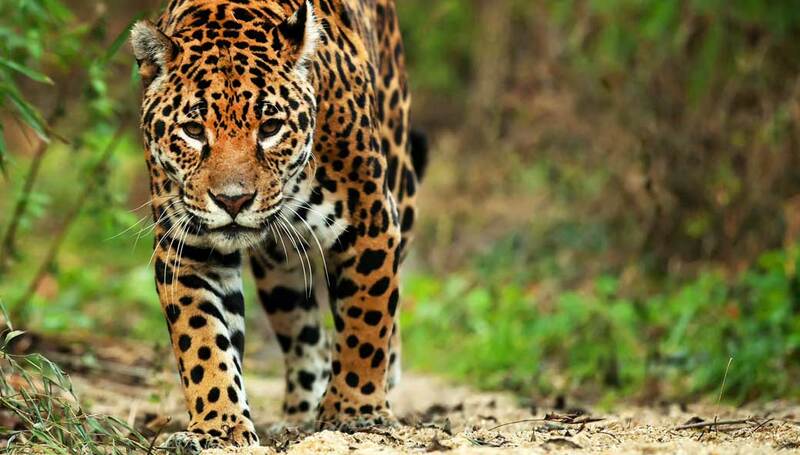 This beautiful big cat is a skillful, fast and powerful hunter, qualities which have given the jaguar a fearsome reputation and mythical status among ancient indigenous cultures. However in recent years its numbers have dwindled, so the estimated population in the wild is between 12,000 and 17,000.
see and save this species on your next trip? Join conservation group Panthera’s Pantanal Project to see how they are working to understand jaguar behaviour, ecology, and its interactions with livestock. Accompanied by an expert naturalist or research scientist, explore the swamp on horseback with local Pantaneiros in search of these beautiful predators. are critically endangered with only about 1,600 left in the wild and due to their solitary nature, they are extremely difficult to find. It is usually only scientific groups who trek into the forests searching for them to study. of seeing the notoriously secretive creatures, you can join an expert from the WWF at the Foping Nature Reserve. With between 200-300 pandas roaming this forested valley you will have an excellent chance of seeing one of these iconic animals that few people have seen in the wild. a common sight in the Mediterranean the Monk Seal is now all but extinct with fewer than 600 surviving. A dedicated group of conservationists carefully monitors these playful creatures to ensure their survival. up with the experts from the Mediterranean Monk Seal Group and they’ll be able to show you a true mark of success. For the first time in 25 years monk seals have set up home in the Adriatic. Having been absent since 1990 a small group of five seals have been recorded living on Croatia’s Kamenjak Peninsula. Now they can regularly been seen playing and splashing in the waters around Centinera u Banjolama beach. have an ethical obligation to protect other species; we prize diversity and natural beauty and should recognise that biodiversity is a vital resource. By travelling to see these endangered creatures not only will you have an amazing experience but also help to protect the last few of their kind. help save your favourite endangered animal contact us.